Blog - Are LED Light Bulbs Energy Efficient? Are LED Light Bulbs Energy Efficient? In a survey of green technology for businesses, energy efficient lighting came out as one of the top options. LED lamps can reduce energy used over incandescent lighting by as much as 90%. However, while LED lighting can be very good for mood or task lighting, using LED as a main source of ambient light (back ground light) needs to be carried out with care. For example, the city council in Edinburgh turned up the brightness of their new LED street lamps and luminaires after locals residents complained that energy efficient LEDS left areas of dark shadow. Conventional light sources cast a lot of light backwards, which in most cases is lost energy, the LED on the other hand casts light in one direction. In offices energy efficient LED lay in modular fittings are 36w where as their fluorescent counterparts are 72w. 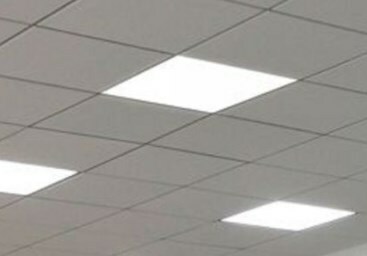 While fluorescent light is much more energy efficient than incandescent lighting, they are not environmentally friendly having mercury gas within the fluorescent tube. LED lay in modular fittings are still 50% more energy efficient that fluorescent. LEDs have longer lamp life and the lumen degradation over the lifetime of the lamp is less, LED lamps retain as much as 90% of their maximum output at the end of their life cycle. LEDs are far more durable than incandescent and fluorescent lights; LEDs can last for typically 50,000 hours, with many lasting up to 80,000 hours, while incandescent or fluorescent lights typically offer a 10,000 hour lifespan. LEDs are suitable for a wide range of environments; they offer safer lighting levels in factories and warehouses. LED stands for 'Light Emitting Diode', which is a solid-state semiconductor light source. LED lighting is a popular choice of low energy lighting because it offers exceptional energy saving properties. The main advantage is the high luminous efficiency which was 18-22 lumens per watt in 2002, compared to conventional 60-100W incandescent light bulbs which only emit around 15 lumens per watt. The development of LED technology has caused their efficiency and light output to rise exponentially with a doubling occurring approximately every 36 months since the 1960s. in 2011 LEDs reached a new level of efficiency emitting 450 to 650 lumens from a 6W LED. This output is equivalent to a 40W incandescent bulb and a typical 13W LED in 2009. Additionally, because re-lamping costs are reduced though the longer lifespan of LED lamps, there is reduced waste going to landfill which also has a positive environmental impact.